The Leek series from Kershaw includes some of their most popular knives. And no wonder. Kershaw's Leeks offer Ken Onion's distinctive design as well as the SpeedSafe ambidextrous assisted opening system. With SpeedSafe, the user can smoothly and easily deploy the blade with one hand, either left or right. The Leek series from Kershaw includes some of their most popular knives. And no wonder. 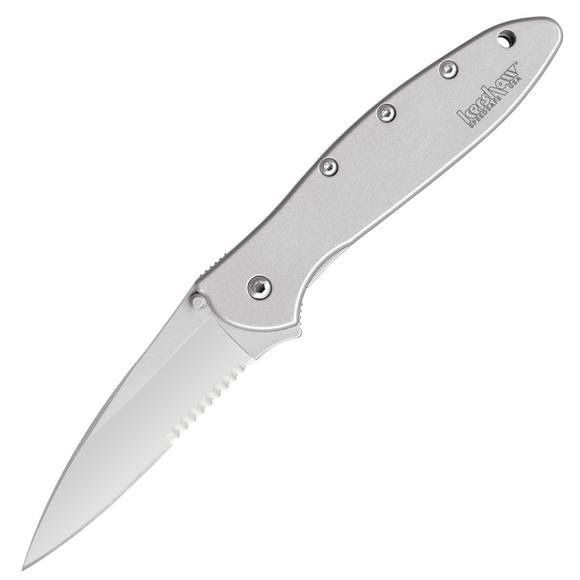 Kershaw&apos;s Leeks offer Ken Onion&apos;s distinctive design as well as the SpeedSafe ambidextrous assisted opening system. With SpeedSafe, the user can smoothly and easily deploy the blade with one hand, either left or right. Leeks come in a variety of handle styles, some with technologically advanced coatings for enhanced performance. For ease of carrying, all Leeks include a reversible/removable pocket clip. To release the frame lock simply press the spring loaded lock and the blade will easily fold back into the handle. Many of our models that come with clips can be kept all the way inside your pocket, as in rolling around the bottom of your pocket. It can also be used as a money clip. This clip may be removed if you choose. Please see other descriptions, such as Reversible Clip.